The Southern Front (Arabic: الجبهة الجنوبية‎) was a Syrian rebel alliance consisting of 58 or 54 Syrian opposition factions affiliated with the Free Syrian Army, established on 13 February 2014 in southern Syria. By June 2015, the Southern Front controlled about 70 percent of Daraa Governorate, according to the International Institute for Strategic Studies. Claims have been made by the Southern Front itself and by media in Britain, Germany and the United Arab Emirates that the Southern Front is being funded by the US and its allies, possibly through a US led Military Operations Center (MOC) based in Amman, Jordan. Since its formation, rebels said, field operation rooms have been added inside Syria to improve coordination between units. The coalition was "described by Western officials as the best organized of the mainstream opposition". The constituent groups ranged from secularist groups to moderate religious groups, and the Southern front has been described as a "non-hardline Islamist rebel group" that rejects extremism. The Southern Front was an alliance of over 50 rebel groups, ranging from secularist to moderately religious. Bashar al-Zoubi, head of the Yarmouk Army, said to the BBC in 2014 that the groups or factions of the Southern Front are militarily coordinated by a moving command centre with a unified leadership but with no overall commander and no centralised command—which is contradictory. The Carter Center, a private organization in the U.S. promoting human rights globally, in February 2015 also described the Southern Front as a loose coalition of self-described moderate armed groups without leadership or organizational structure, that agreed on the name ‘Southern Front’ to receive support from the inter-governmental Friends of Syria through the southern MOC ("Military Operations Center") in Amman. The Syrian Observer on 14 February 2014 stated that 49 rebel groups in southern Syria had announced in a statement the establishment of ‘The Southern Front’ and suggested vaguely that that Southern Front were affiliated with FSA. The Carnegie Endowment for International Peace mentioned on 21 March 2014 that the ‘Omari Brigades’, one of the FSA units from 2011, became a member faction of 'Syrian Revolutionaries Front' (created in December 2013) which was in mid-February 2014 one of the 49 factions that banded together as the Southern Front signing a statement. The Huffington Post stated on 15 May 2014 that a loose coalition of about 50 rebel units including the largest FSA units in southern Syria in February 2014 had announced the establishment of the Southern Front. The National Interest stated on 6 July 2015 that the Southern Front is a coalition of Free Syrian Army brigades, which had made significant gains in Daraa Governorate. Dutch newspaper NRC Handelsblad wrote on 10 October 2015: "Saudi Arabia is increasing its weapons deliveries to Syrian rebels. That concerns three different groups: Jaish al-Fatah, the Free Syrian Army, and the Southern Front." The International Business Times on 12 March 2016 made mention of a ‘Southern Front’ which it describes as a group of Syrian opposition groups formerly members of FSA, focusing primarily on the Daraa and Quneitra governorates. In mid-February 2014, according to a Syrian rebel brigade officer, the Military Operations Command (MOC) in Jordan designed for channeling Western and Gulf aid to moderate rebel forces in southern Syria convened a meeting with leaders of nearly 50 southern rebel groups and directed them to create a new umbrella coalition. This resulted in the "Southern Front" being formed on 13 February 2014. The formation of the front and its backing by western forces challenged al-Nusra's military and political success in the region, though Southern Front units continued to cooperate with al-Nusra forces. The Southern Front quickly became the largest rebel fighter umbrella organization in Southern Syria, comprising 25–30,000 fighters, the great majority of the South's rebel groups and manpower. As of February 2015, Southern Front operations were executed through seven 'Southern Front operation rooms'. In June 2015, the SF launched Operation Southern Storm to take Deraa city's northern and eastern districts from government control. The operation was largely unsuccessful. After Operation Southern Storm, SF declined in size and lost some of its support from the MOC. In late 2016, its then 58 groups were re-organised around four of the largest units with close ties to the MOC: Youth of Sunnah Brigade, Yarmouk Army, 24th Infantry Division and Amoud Houran Division. On 18 June 2018, the Southern Front was hit by ”Operation Basalt”, a pro-Syrian government offensive in Daraa and Quneitra province. By 23 July the forces of the Southern Front were fully defeated, and lost all territory that was under their control. Surrendering fighters agreed to either reconciliation deals or were relocated to Idlib. Southern Front fighters raise the Syrian independence flag, 2 August 2017. General Ibrahim Jbawi, spokesperson for the Southern Front, stated in November 2014 that his group received money and weapons from the US, France, Jordan and Saudi Arabia. Activists said that Jordan also facilitated the Southern Front by allowing them to cross freely to and from Jordan. The Abu Dhabi (United Arab Emirates) based newspaper The National stated in November 2014 that the Military Operations Command centre (MOC) in Amman, Jordan, staffed by "western and Arab military officials", had sent out food baskets to six rebel factions in southern Syria, presumably members of the Southern Front. The BBC, not revealing its sources, claimed in December 2014 that the Southern Front was “backed” through the Military Operations Center in Jordan, "a logisitics and supply hub" run by the US with European and Arab allies. The German Heinrich Böll Foundation claimed in 2015 that the Southern Front is being "funded" by a Military Operations Center (MOC) in Amman, Jordan which is run by "the US and its allies", but did not specify or corroborate what that "funding" implied. No American official has yet admitted to the US supporting the Southern Front. The MOC has reportedly been inactive since 2017. The National also reported that Southern Front members participating in the fight against the Syrian government receive $50–$100 per month while those who fight against ISIL receive $100–$250 per month from the MOC. However, the MOC threatened to cut funds unless the SF launch an offensive against ISIL. In July and August 2016 more than 200 rebels from the Southern Front defected to Jabhat Fateh al-Sham, successor to al-Nusra Front, and Ahrar al-Sham due to better pay and more willingness to fight government forces. In the second half of 2016, Southern Front member groups where involved in failed operations against ISIS, those being the 2016 Abu Kamal offensive and the Eastern Qalamoun 2016 offensive. On 12 February 2017, Free Syrian Army groups (Southern Front and the Army of Free Tribes), Tahrir al-Sham, Ahrar al-Sham, Jaysh al-Islam, Jabhat Ansar al-Islam, and Alwiya al-Furqan - working together as part of the Unified Ranks operations room - launch an offensive in Daraa. A week into the first phase of the offensive, ISIL also started an offensive against the Daraa-based rebels, lasting a week and resulting in an ISIL victory. Clashes between the Southern Front-led rebels and ISIL continued for the next few months. From 29 December 2016 to 30 April 2017, a myriad of groups that allegedly included Tahrir al-Sham launched a multi-phase operation in the Eastern Qalamun Mountains and the Syrian Desert with the aim to expel the Islamic State of Iraq and the Levant from the desert in southern Syria and to open a supply route between two rebel-held areas. The operation was successful in pushing back ISIL, though they were unable to connect the two rebel-held areas as due to heavy resistance from ISIS. during the operation, the government was also able to take territory from ISIL. On 7 May, the government launched their desert campaign that initially started along the highway from Damascus to the border with Iraq against rebel forces. Its first intended goal was to capture both the highway and the al-Tanf border crossing, thus securing the Damascus countryside from a potential rebel attack, later, multiple other fronts were opened as part of the operation throughout the desert, as well as operation "Grand Dawn" against ISIL with the aim of reopening the Damascus-Palmyra highway and preparing for an offensive towards Deir ez-Zor. The operation is ongoing and has resulted in the Syrian Army encircling the rebel-held Eastern Qalamoun pocket and at the same time erasing the front-line between rebel forces and ISIL in the An-Tanf area. On 24 June 2017, Tahrir al-Sham, FSA groups, and other rebels reportedly established the Army of Muhammad operations room and launched a new Quneitra offensive, targeting the town of Madinat al-Baath, also known as Baath City. [better source needed] The offensive lasted a week, resulting in a government victory, reversing all rebel gains during the offensive. During the fighting, two stray artillery rounds hit the Israeli-occupied Golan Heights, prompting Israeli forces to target the Syrian military artillery position which according to them was the source of the firing. On 3 July 2017, a four-day ceasefire was announced by the government, in opposition-held southern Syria. As a precursor to Astana 5 peace talks, on 9 July 2017 at 0900 GMT, an American-Russian-Jordanian brokered ceasefire commenced, though on 14 July, opposition groups participating in the Quneitra offensive rejected the ceasefire, with clashes resuming across Southern Syria. Besides minor violations from all sides involved, as of 15 July, the ceasefire as held. The Southern Front boycotted these talks. A Sword of al-Sham Brigades (Ezz Brigade's Jesus Christ Brigade) fighter prepares to launch a BGM-71 TOW missile. 11th Special Forces Division (left in September 2015 during the establishment of the Company of the People of the Levant, joining the Sham Liberation Army. Jaysh al-Ababil left the Southern Alliance in July 2018 to establish the Army of the South, in response to the encirclement of Daraa city that same month. ^ a b c d Cafarella, Jennifer (December 2014). "JABHAT AL-NUSRA IN SYRIA" (PDF). Institute for the Study of War. p. 36. Retrieved 5 July 2016. ^ a b "Moderate Rebel Groups Unite in Southern Syria". Syrian Observer. 14 February 2014. Retrieved 14 November 2014. ^ "Rebels suffer worst defeat of war after losing #Daraa to Syrian Army - map". Al-Masdar. 21 July 2018. ^ a b "The Free Syrian Army – Southern Front: Transitional Phase". Revolutionary Forces of Syria Media Office. 15 December 2014. Retrieved 30 May 2015. It is imperative that all nationalist forces commit to a course of action during the period of transition from authoritarianism that will fulfil the popular will [...] The current constitution will be immediately suspended and replaced by the original constitution of 1950 as an interim constitution until the drafting of a permanent constitution for the country that shall be approved by a popular referendum. ^ a b c d e f g h Haid, Haid (21 August 2015). "The Southern Front: allies without a strategy". Heinrich Böll Foundation. Retrieved 30 August 2015. ^ Rand, Dafna H.; Heras, Nicholas (29 December 2014). "The South Will Rise Again". Foreign Policy. Retrieved 5 June 2015. Williams, Sara Elizabeth (26 May 2014). "A rebel rift is brewing on Syria's southern front". Vice News. Retrieved 5 June 2015. ^ a b c Rosenthal, Max J. (15 May 2014). "Syrian Rebels Say Southern Front Strategy Hasn't Hurt Assad Yet". The Huffington Post. Retrieved 14 November 2014. ^ a b c d e f Aron Lund (21 March 2014). "Does the "Southern Front" Exist?". Carnegie Endowment for International Peace. Retrieved 14 November 2014. ^ "Yes, there are 70,000 moderate opposition fighters in Syria. Here's what we know about them - Coffee House". 27 November 2015. ^ "Who are the rebels in southern Syria?". AFP. Retrieved 4 July 2018. ^ "Islamic State raises flags over towns in Daraa after fierce battles". Middle East Eye. 21 March 2016. ^ a b c d e Ghattas, Kim (9 December 2014). "Syria war: Southern rebels see US as key to success". BBC News. Retrieved 18 February 2016. ^ a b Naylor, Hugh (10 June 2015). "Moderate rebels take key southern base in Syria, dealing blow to Assad". The Washington Post. Retrieved 10 June 2015. Emile Hokayem, a Middle East analyst at the London-based International Institute for Strategic Studies, said the fall of Brigade 52 weakens government defenses around the capital [...] "The Southern Front is now showing itself as an increasingly effective buffer against Islamist rebels as well as an effective means for applying pressure on the Assad regime," Hokayem said. The rebels control about 70 percent of Daraa and are poised to seize the provincial capital from Assad’s forces, he said. ^ a b c "US-backed Syria rebels make new push south of Damascus". Fox News. Associated Press. 28 November 2014. Retrieved 18 February 2016. ^ a b c d e Maayeh, Suha; Sands, Phil (25 November 2014). "Syria's southern rebels draw up new game plan". The National. Retrieved 30 May 2015. ^ a b Perry, Tom (30 May 2015). "Syria rebels in south emerge as West's last hope as moderates crushed elsewhere". Reuters. Retrieved 14 November 2014. ^ "Syria Countrywide Conflict Report No. 5" (PDF). The Carter Center. February 2015. p. 7. Retrieved 20 February 2016. ^ "Syria Countrywide Conflict Report No. 5" (PDF). The Carter Center. February 2015. p. 11. Retrieved 20 February 2016. ^ ‘Syria’s last best hope: the Southern Front’, The National Interest, 6 July 2015. Retrieved 3 July 2016. ^ (in Dutch) ‘VS stoppen met trainen rebellen’ (US stop training rebels). NRC Handelsblad, 10 October 2015. Retrieved 3 July 2016. ^ ‘US launches rockets into southern Syria for first time’, International Business Times, 12 March 2016. Retrieved 3 July 2016. ^ cafarella, Jennifer (December 2014). "JABHAT AL-NUSRA IN SYRIA" (PDF). Institute for the Study of War. Retrieved 3 March 2016. ^ a b ""تحالف صقور الجنوب" .. توحد جديد في درعا". Shaam News. 27 December 2014. Retrieved 8 January 2015. ^ a b "Three important Free Syrian Army factions decided, at this 2015 new year, to create the First Army". SRO. 1 January 2015. Retrieved 2 January 2015. ^ "Syria Countrywide Conflict Report No. 5" (PDF). The Carter Center. February 2015. p. 23. Retrieved 21 June 2016. ^ a b c d e f g h Syrian Rebellion Obs [@Syria_Rebel_Obs] (15 May 2015). "#SRO – Exclusive – As announced yesterday by #SRO, #FSA Southern Front has now a one and official Military Council" (Tweet). Retrieved 2 June 2015 – via Twitter. ^ ألف مقاتل يرفدون الجنوبية الجبهة (YouTube video) (in Arabic). Daraa, Syria: SMART News Agency. 1 June 2015. Archived from the original on 6 March 2016. Retrieved 2 June 2015. ^ "Syrian Government forces seal victory in southern territories". Guardian. 31 July 2018. Retrieved 14 August 2018. ^ ‘Syrian rebels get arms and advice through secret command centre in Amman’. The National, 29 December 2013. Retrieved 18 February 2016. ^ "Jordan, Israel hedge their bets in southwest Syria". Al-Monitor. 22 March 2018. ^ "Far from Raqqa and Fallujah, Syria rebels open new front against ISIL in the south". The National. 28 May 2016. ^ a b "The Moderate Rebels: A Complete and Growing List of Vetted Groups". الثورة الديمقراطية، الطراز السوري Democratic Revolution, Syrian Style. 21 October 2014. Retrieved 14 November 2014. ^ "SELECTED SUPREME MILITARY COMMAND MEMBERS" (PDF). Institute for the Study of War. Retrieved 30 November 2014. ^ "Geneva talks: Syria constitution proposal on hold". www.aljazeera.com. "Issam Al Reis (@south_front_sy) - Twitter". twitter.com. News, F. S. A. (14 June 2017). "#FSA -- #Syria "#Russia is the regime's partner in escalation & not a guarantor of deescalation" - Major Issam al Reis, FSA Spokesmanpic.twitter.com/f7gyprGzVP". Twitter. ^ "Mainstream Syrian rebels seize historic town in south: monitor". Reuters. Retrieved 25 March 2015. ^ "ISIS Storms Damascus Suburb of Yarmouk: monitor". dailystar. Retrieved 1 April 2015. ^ "Syrian rebels say launch offensive in southern Syria". Reuters. 17 June 2015. Retrieved 17 June 2015. ^ "Syrian rebels launch attack to take Southern city of Daraa". St. Louis Post Dispatch. AP. 25 June 2015. Retrieved 25 June 2015. ^ "Stalemates, defections and shifting alliances: Syria's restive south at crossroads". Syria:direct. 27 July 2016. ^ "Islamic State affiliate's surprise offensive pays off as rebels distracted in Daraa city". Syria:direct. 20 February 2017. Tomson, Chris (20 February 2017). "Massive rebel collapse in Daraa as ISIS sweeps through several towns". al-Masdar. ^ "Assad Forces Teetering on Defeat in Last Manshiyah Strongholds". The Syrian Observer. Retrieved 26 May 2017. ^ "Syrian Army captures half of the Dara'a Camp: map". al-Masdar. 13 June 2017. Retrieved 14 June 2017. "VIDEO: Syrian warplanes return with a vengeance over Daraa after reconciliation deal falls apart". AMN – Al-Masdar News | المصدر نيوز. 23 June 2017. Retrieved 23 June 2017. "Syrian Army captures half of the Dara'a Camp: map". Al-Masdar. 13 June 2017. ^ a b "Rebel Israeli-backed offensive ultimately fails as Syrian Army recaptures all territory". Al-Masdar. 2 July 2017. ^ "Israel retaliates after stray Syrian fire in Golan". 2 July 2017. ^ "Syrian army announces ceasefire in south ahead of Astana talks". Reuters. 4 July 2017. ^ "U.S.-Russian ceasefire deal holding in southwest Syria". Reuters. 9 July 2017. AP (7 July 2017). "AP sources: U.S., Russia reach deal on Syria cease-fire". PBS. "Rebel factions in southern Syria reject ceasefire deal". Al-Masdar. 14 July 2017. ^ a b "'Precarious calm' in southwest Syria amid cease-fire". al-Monitor. 14 July 2017. ^ "Coalition "forces of the South" includes eight factions and brigades ... and a preliminary step for integration". Sham News Network. 9 February 2017. ^ "Factions in Daraa & Quneitra annouce [sic] military alliance "Salvation Army"". Syria Call. 27 May 2018. ^ oreusser (19 May 2017). "As a reaction, Ahrar Nawa published a statement calling on the population and groups to fight the proliferation of arms in the area.pic.twitter.com/3aPJd5XMwl". Twitter. ^ SMO Syria (29 April 2015). "#سوريا #درعا : بيان انضمام لواء راية الإسلام لفرقة فجر التوحيد التابعة للجبهة_الجنوبية" – via YouTube. ^ "A new military alliance in the Syrian south,what does it consist of?". Al-Dorar al-Shamia. 16 August 2017. ^ "Syria dissident groups still not united". Al Monitor. 5 March 2015. Retrieved 5 March 2015. ^ "SYRIAN REVOLUTIONARY FRONT ANNOUNCES NEW STRUCTURE AND FORMATION OF 1ST INFANTRY DIVISION". Syria's Tomorrow. 31 July 2017. ^ Szakola, Albin. "FSA factions reorganizing in southern Syria". Now. Retrieved 6 July 2016. 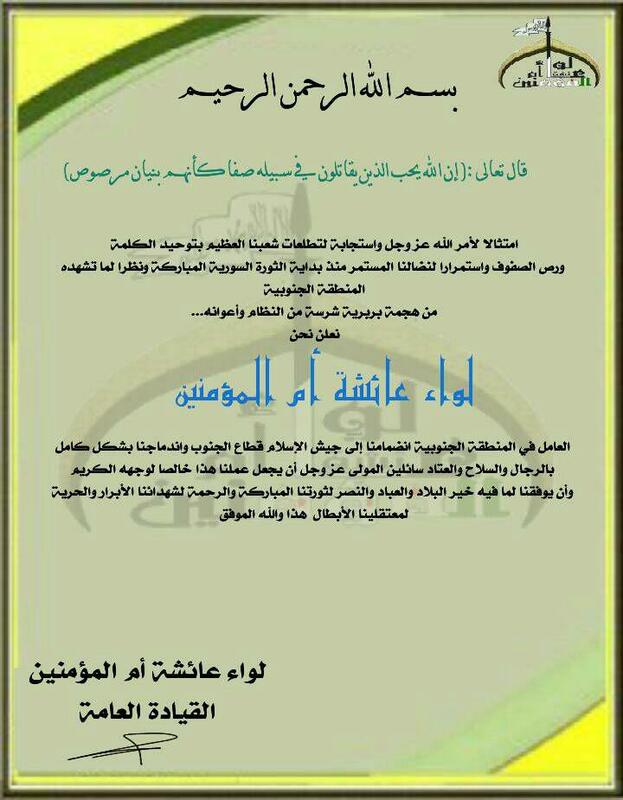 ^ "Military factions announce the formation of the 63rd Division of Quneitra countryside declaring its objectives". Al-Dorar al-Shamia. 17 August 2017. ^ احمد الجولاني (5 June 2016). "مميز// تشكيل فرقة سيف الجنوب في المنطقة الجنوبية بسوريا 5/6/2016" – via YouTube. ^ abo baker (8 September 2017). "الجيش السوري الحر-الجبهة الجنوبية- الفرقة/406/مشاة" – via YouTube. ^ "FSA Southern Front's Political Program for Post-Assad Syria". Democratic Revolution, Syrian Style. 6 December 2014. Retrieved 6 December 2014. ^ website), Al-Souria Net (opposition. "Daraa Factions Merge Under 'Southern Brigades'". ^ "5 rebel factions launch attack on regime army in Quneitra province SYRIA NEWS - ZAMAN ALWSL". "فصائل عسكرية تتحد وتشكل جيش التوحيد في القنيطرة - آرانيوز". 26 February 2016. ^ SMART News Agency - وكالة سمارت للأنباء (4 April 2017). "تشكيل مجلس عسكري ثوري لعدد من القرى في القنيطرة" – via YouTube. ^ Aymenn Jawad Al-Tamimi (3 July 2017). Jonathan Spyer (ed.). "Arab Media: Israeli Bombardment Killed, Wounded Targets inside Syria". Rubin Center. Retrieved 4 July 2017. ^ almotasem daraa (12 March 2015). "إعلان تشكيل الكتيبة 22 مشاة في مدينة درعا التابعة للواء المعتصم بالله وتحت راية الجبهة الجنوبية". YouTube. ^ "The Moderate Rebels: A Growing List of Vetted Groups Fielding BGM-71 TOW Anti-Tank Guided Missiles". Retrieved 19 October 2015. "English Statement: First Brigade in Damascus has fully merged with al-Rahman Corps". Beyond The Levant Agency. Retrieved 4 May 2016. ^ "Jaysh Usud al-Sharqiya: Exiles of the Euphrates - bellingcat". 17 April 2017. ^ "Army of Islam executes Abu Ali Khbaybah in the eastern Ghouta". Enab Baladi. 1 September 2015. ^ "Free army factions in the south announce the formation of the "National Front for the Liberation of Syria"". El-Dorar al-Shamia. 22 July 2017. ^ "FSA Southern Front Declaration of Principles". ^ a b mofakher hayik (24 July 2017). "الثورة السورية(4)" – via YouTube. This page was last edited on 1 January 2019, at 07:38 (UTC).